Old Brodleians led a 22-0 lead slip away to fellow strugglers North Ribblesdale on Saturday, losing 26-25 to a late converted try. 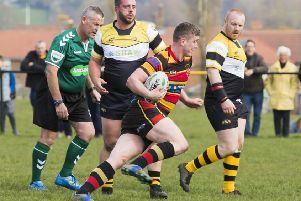 The losing bonus point kept the Halifax side out of the bottom two in Yorkshire One but raised the stakes even higher for next weekend’s home derby against Heath. Saturday’s combatants at Settle have both been showing improved form and they produced some quality rugby that belied their lowly status in a truly enthralling encounter. Brods opened with such high tempo that they blew away their hosts in the opening minutes. Following very capable defence of the kick off in their own 22, the Brods forwards powered down the field from halfway with a 30 metre drive. The ball was then moved through several pairs of hands and Peter Williams finished in fine style to the right of the posts. Dan Wood converted for a 7-0 lead after three minutes. On 10 minutes Joe Armitage picked up from the base of the scrum, dummied to pass and outpaced the defence to score in the corner. Four minutes later the Brods pack confirmed their superiority with another driving maul led by Williams to the posts. Stirling Ross took his chance to power over from close quarters and Wood’s conversion made it 19-0. Wood extended the lead to 22-0 with a penalty after 25 minutes and the scoreline reflected Brods’ dominance in every area. The home side gained some momentum with a try just before half time. With Ross yellow carded and Rob Jennings off with a jaw injury, Ribb started to stretch the Brods defence through some good attacking play featuring fullback Waites and winger Simon Bolland. Waites scored after 15 minutes of the second half at 12-22 it was game on. The home side were now getting a share of possession and pressed the Brods line. The visitors’ defence was good, however, and Tom Williams broke out of defence with a clear field in front of him but pulled up with a thigh injury and the chance was gone. Ribb responded immediately and right winger Boland crossed. The conversion cut the deficit to three points. Both sides continued to play attractive rugby and Wood calmly made it 19-25 with a penalty for side entry at a ruck. In the closing minutes Ribb camped on the Brods line. Several penalties were conceded at scrum and maul and eventually the visitors defence broke as Ribb flanker Carr was driven over by his fellow forwards. Waites converted and the Hipperholme boys were left to reflect on how they could lose a game in which they were so dominant for long periods. Brods’ development or second team made it 11 wins on the bounce with a 50-12 friendly win over higher-division Cleckheaton. They will look forward to their own home derby on Saturday when they will play Heath seconds prior to the first team fixture at Woodhead. The Beavers won 34-12 in the league at Skipton and now sit just one point behind leaders Ilkley in the district merit table.